I am interested in the meaning, determinants, and consequences of social identities, especially national/ethnic as well as party identification. I also analyze the effects of other determinants (e.g. political knowledge, social norms, personality) on (comparative) electoral behaviour. Furthermore, my research interests also lie in the field of Science Studies. I focus on conceptions of authorship and determinants of research productivity. My dissertation is based on the assumption that party identification is a broad theoretical concept; however, it is currently measured with rather narrow operationalizations. Two major problems could be identified for those operationalizations: First, the existing measures are not based on valid instruments from social-psychological research and do not take current social psychological research into account. Second, negative and multiple party identifications can not be measured. My work consists of three parts and ends with a proposal for a new, validated measure of party identification. First, I focus on the conceptualization of party identification within the social identity approach. Contrary to previous works, I do not only take Social Identity Theory, but also Self-Categoriziation Theory into account, that corresponds more closely to the original notion of party identification as a normative reference group identification. In addition, I conceptualize negative and multiple party identifications within this approach. Party identification is often referred to as a multi-dimensional concept, however, not much is known about its different dimensions. Drawing on the original works from Campbell et al. (Belknap and Campbell 1952; Campbell et al. 1954, 1960), I identify two important dimensions, a cognitive dimension (knowing/being aware that one belongs to a party) and an affective dimension (the emotional value the party holds for an adherent). In addition, self-stereotyping oneself as an ideal-typical adherent forms a third dimension. I’m an adherent of this party. This party’s successes are my successes. I have a number of qualities typical of adherents of this party. 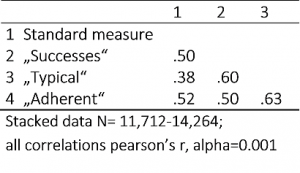 Last, I confirm the validity of the new measures by using the concept of construct validation. For that, I use data from a three-wave online survey, conducted in 2013, and the representative GESIS-Panel, Wave 9, conducted in 2015. The new IDPP scale was measured for all five major German parties, using seven-point rating scales. In addition, the standard measure was included in the surveys as well. 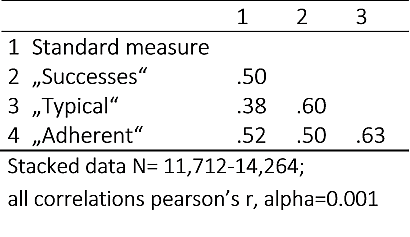 For each party, the mean of the three items of the IDPP scale was calculated. Respondents with values above 4 were counted as adherents. Based on the representative survey from June 2015, 60 percent of all participants can be classified as adherents, based on the new measure; about half of all adherents report multiple party identifications (31 percent with two, 18 percent with three parties). These multiple party identifications run mainly within political camps (63 percent). About 40 percent are of the same strength (within 0.3 scale points). 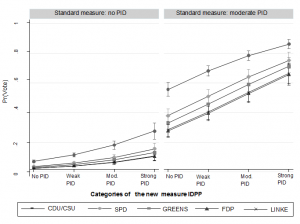 The German standard measure is moderately correlated with the new items, as it was expected: The new items, especially the item for the self-stereotyping dimension, cover dimensions of party identification that were not part of the standard measure. Predicted probabilities of voting for the identification party, based on a logistic regression including party identification strength, candidate evaluations, issue orientations (competency to solve the most important problem in the country), age, gender, education, origin (East Germany/West Germany), and political interest. All other variables were held at their means. Stacked data. 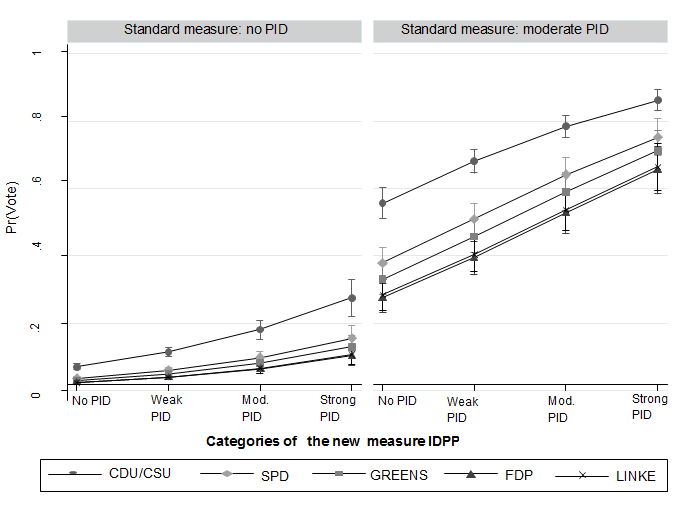 Most research designs so far, that explored the potential of the new party identification measures, used the standard measure as a filter which does not allow analyzing both measures simultaneously. I show that even when the standard measure is controlled for, the new measure has an independent effect on vote choice.